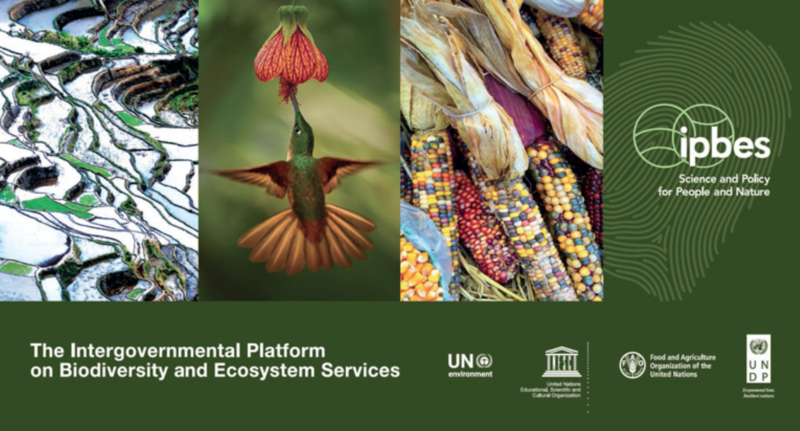 The Intergovernmental Science-Policy Platform on Biodiversity and Ecosystem Services (IPBES) is an independent intergovernmental body, established by member States in 2012. – Assessments: On specific themes (e.g. “Pollinators, Pollination and Food Production”); methodological issues (e.g. “Scenarios and Modelling); and at both the regional and global levels (e.g. “Global Assessment of Biodiversity and Ecosystem Services”). – Policy Support: Identifying policy-relevant tools and methodologies, facilitating their use, and catalyzing their further development. – Building Capacity & Knowledge: Identifying and meeting the priority capacity, knowledge and data needs of our member States, experts and stakeholders. – Communications & Outreach: Ensuring the widest reach and impact of our work. The mission of IPBES is to strengthen knowledge foundations for better policy through science, for the conservation and sustainable use of biodiversity, long-term human well-being and sustainable development. Essentially, IPBES does for biodiversity what the IPCC does for climate change. It provides policymakers with objective scientific assessments about the state of knowledge regarding the planet’s biodiversity, ecosystems and the benefits they provide to people, as well as the tools and methods to protect and sustainably use these vital natural assets. – Agricultural production dependent on animal pollination has increased by 300% over the past 50 years, but pollinator-dependent crops show lower growth and stability in yield than crops that do not depend on pollinators. – Nearly 90% of all wild flowering plants depend to some extent on animal pollination. – 16% of vertebrate pollinators are threatened with global extinction – increasing to 30 per cent for island species – with a trend towards more extinctions. – Pesticides, including neonicotinoid insecticides, threaten pollinators worldwide, although the long-term effects are still unknown. – A range of actions can be taken to safeguard pollinators, from ensuring greater diversity of habitats to promoting sustainable agriculture; supporting traditional practices such as those that manage habitat patchiness and crop rotation; wider education and knowledge-exchange; decreasing exposure of pollinators to pesticides; and improving managed bee husbandry. Check out the media releases page to explore the above topics and many more compiled by IPBES. Coming up soon is IPBES Plenary 7, which will be held in Paris, France! This is a great opportunity to observe how IPBES functions, negotiations surrounding the global assessment, and policy development. IFSA members are also encouraged to participate in the discussion forum on Facebook for exploration of topics covered at COP14 and IPBES 7.